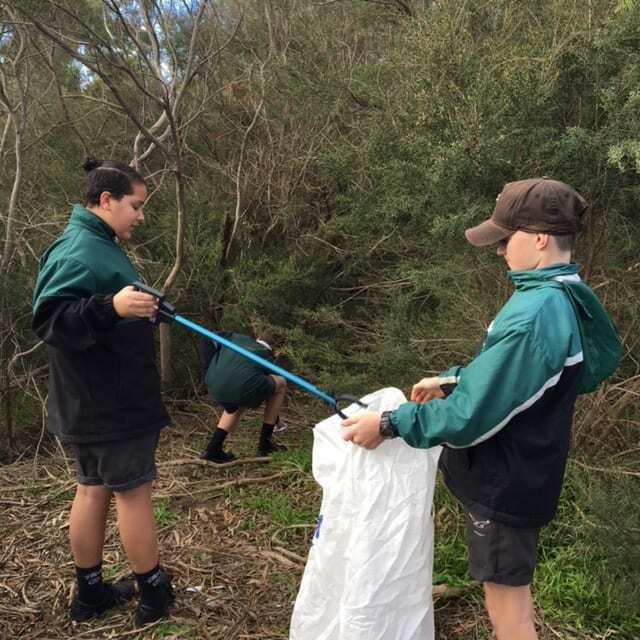 Today (Monday 6th August 2018) 3 Year 8 students cleaned up a very small section of our bush block. Pierre, Mason and Ayden picked up 149 pieces of rubbish in 30 minutes. At least half of that rubbish was from items students had purchased from our canteen. When students don’t put it in the bin it ends up blowing into our bush block. One student commented, “I haven’t’ seen that lolly wrapper for years.” This highlights how long it takes things to break down! Our school has been involved in the Sustainable Schools program for five years. Our aim has been to increase environmental awareness and to model environmental, social and economic sustainability, bring families and community together and teach core values and practical skills. We became involved in sustainability when we were invited to be one of the schools which formed part of a sustainable schools trail on the Mornington Peninsula which showcased sustainability projects to the community. We have worked closely with CERES and local consultants over the last five years to become the first state secondary school to be fully accredited as a five start sustainable school. We received our accreditation last year. Best practice in terms of sustainability is being cultivated across all aspects of the school and is reflected in the curriculum. Our efforts in terms of sustainability connect with Western Port’s commitment to building community and social cohesion in the broader sense and provides opportunities for inclusion and cultural enrichment. We have been a model for other schools in taking steps to avert climate change and are regularly contacted and visited for advice as other schools begin their journey to sustainability. Both students and staff have presented at conferences and forums on environmental sustainability. The keep Australia Beautiful Victoria Tidy Towns – Sustainable Communities Awards recognise positive actions taken by communities in rural and regional areas to protect and enhance their local environments. They encompass initiatives as diverse as litter prevention, recycling, protection of environment, preserving heritage, community action and leadership and environmental sustainability programs. The Shire is pleased to announce that Sustainability Victoria have recognised Western Port Secondary College in the Community Action over 3000 category for the Spiral Meditation Garden. In 2007 we were finalists in the Victorian Education Excellence awards Curriculum Innovation category for our Outdoor Classroom. Everything you can see in our Outdoor Classroom was created by students. We use the pizza oven, built by a year 10 Fundamental Maths class, to bake pizzas and the occasional roast. cabbages, cauliflowers, garlic and pumpkins. They make delicious soups and vegetable and herb scones with the produce! They also look after our chooks and guinea pigs and sell excess vegies and eggs to staff. A vear 8 History class researched, designed and made the medieval garden next to the Learning Centre. It is a more formal style garden with its brick paths donated by a parent and the medicinal herbs and citrus trees that grow there. A senior VCAL class made the bird hide near the wetland. The tiered seating was constructed by a VET Construction class and the giant chessboard was made by a year 10 math class. The rendered couches and haybale table with the mosaiced top was made by year 8 students who then went on to make one at Somers Primary school. Our couches feature at all our local primary schools where our students worked with younger students to make them. We know that young people learn best when they teach each other. The native garden next to the hay bale table was planted by the same year 8 students in the ‘Active Learning’ program to attract lizards and birds to the Outdoor Classroom. Look for the banksia flowers. Aboriginal people dip the flowers in water to make a refreshing sweet honey drink from the nectar. Students with families in the Defence Force worked with Donna Nairn to create a memorial garden as part of our Meditation Spiral. They decorated a beautful bowl with poppies and flags and planted rosemary and lavender and poppies in the surrounding garden. The many students who have worked on these projects over the years since its inception have left a legacy for the school and broader community, demonstrating civics and citizenship. Most of our projects are student driven, and we pride ourselves in motivating the students to plan and execute projects. We have an in-school grant system where by students learn the process of applying for grants to help fund their projects. We encourage our students to participate in professional development opportunities outside the college, to help teach them the skills of public speaking and school promotion. We have both junior and senior environment captains, who help drive the environmental projects within the school, as well as a Green Team who help to maintain the gardens. We believe in our students ability to become life long learners, responsible citizens and happy adults. We know at Western port Secondary College that our world is in safe hands. These gardens were made possible as a result of a Mornington Peninsula Shire Arts and Culture grant. Students from our Program for Students with Disabilities and from our Environment Team visited the Moonlight Sanctuary to look at its Bush Tucker garden to get inspiration and to increase their knowledge about bush tucker plants. Students from a Year 10 Channelling Futures class worked with their teacher Mr Jarryd Pac to landscape and plant the garden beds and jazz up our concrete couches which provide seating in a shaded area between the two gardens. Two year 7 students constructed 3 bench seats with artisan John Eldridge. They used logs from a tree that we had to have cut down and leftover timber from the construction of our bike shed. The only cost was the screws they used to put it together! We purchased our plants from a local indigenous nursery. Some of the plants in our garden were used traditionally as a food source; others were used by Aboriginal women to weave baskets. The plants in this garden grew in our local area before Europeans came to Australia. We believe it is important to plant indigenous plants to provide habitat for birds and lizards and to increase biodiversity in our school grounds. It also links with 2 AUSVELS cross curriculum priorities: Aboriginal and Torres Strait Islander Histories and Culture and Sustainability. Mayoral sustainability award for school community. On Tuesday March 26th Ms Lewis, Ms Smith, Luke Reardon and Niam O’Toole attended a Sustainability Conference at Bentleigh Secondary College. As Western Port Secondary College is a Mentor School to other schools starting on their journey to 5 start sustainability accreditation, Luke and Niam had the responsibility of running a short workshop for other students. The boys ran a ‘hands on’ activity, teaching 2 groups of students how to make a layered compost. As well they toured Bentleigh Secondary College’s Environmental initiatives which included an urban forest and billabong. The group also had fruitful discussions with organisations such as Melbourne Water, representatives from CERES Environment Park, the Schools Water Efficiency Program, Going Green Solutions, Cool Australia and the Gould League. At the end of the conference each school had to make a pledge to carry out one environmental action. Our pledge is to “Reduce our waste to landfill”. Niam and Luke will be presenting a report and recommendations to the year 9 students as part of the environmental theme in term two. Every class 1n year 7 and 8 will be responsible for an apple crate. They will learn about the value of ‘seed to table’ ie. planting seeds to grow food to make delicious and nutritious meals. We are aiming to create our own ‘slow food movement’ at Western Port Secondary College to combat the fast food culture that surrounds us. Experts are warning that preventable health conditions could make the current generation the first to live shorter lives than their parents. Students will be able to use the vegetables and herbs that they grow. They will also be able to sell some of them and use the profit for activities within their class and for projects of their choice.